Think of sole as the supermodel of fresh fish – there’s nothing nasty to work through before you get to the good stuff – no skin, no bones, nobody’s staring – the polar opposite to the supermodel experience, all skin & bones and plenty of staring! And that’s probably why sole is one of the more popular fish – who wouldn’t like to have dinner with a supermodel? And like those supermodels, can be dressed up in pretty much anything. This is pure perfection right from the moment you spot the delicate-as-paper fillets draped over ice behind the glass at the fish counter or individually flash-frozen and sealed by the kilo in the freezer section. 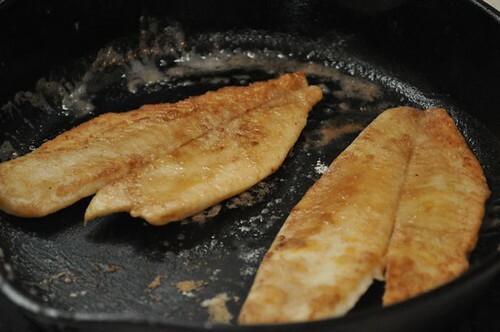 So if eating more fish is on your list of things to start doing – this is the place to start, and this is the recipe – quick and easy lemon sole sauté. It takes less time to cook than it does to prepare – there’s no sitting around answering the familiar refrain heard the world over at dinnertime, “is it ready yet?” – kinda like “are we there yet?” but it’s dinner, and we’re sittin’ in the kitchen. And the best part is you can have these fillets at the ready whenever the mood strikes, if you opt for the frozen variety. Keep these in the freezer and you’re halfway there. Of course, buy them fresh if you’re able, but the pressure will be on to cook ’em up straight away. The good news is fish and seafood are one thing that’s rarely compromised when frozen as it’s usually flash frozen before the boat makes it back to the marina! So fill your freezer and start eating fish as if it were a burger and fries – your waistline and ticker will thank you!